Jon's Ukulele Blog - Ukes Up! I know, I know. I'd only just got started, and suddenly a nearly-two-year hiatus. Why? Three major reasons. Firstly, I had loads of rewarding ukulele teaching work keeping me busy in Surrey: helping young minds explore music and discover new avenues of learning. All sounds very worthy, doesn't it? Partly, though, it's an excuse for a bit of laziness in updating things here. However, the third reason is a bit more substantive: I moved North! After six great years in Surrey and South London, I'm now living in Sheffield. The overriding reason for this was to be closer to my family, who are all Yorkshire-dwellers nowadays, but there have been many other benefits from a personal point of view. Sheffield is, of course, a major city, but due to its geographical structure and position, often manages to feel more like a large collection of villages scattered around a relatively small central hub. This means there's a real sense of community, certainly in the South West where I'm based, and I've enjoyed getting involved in things like local amateur dramatics at The Lantern Theatre. Also the city is fantastically placed for access to the Peak District - a beautiful part of the country if you like a walk or a climb. "That's all very lovely, Jon, but what's coming up on the website? ", I hear you collectively cry. Well, I'm glad you asked. Knowing myself as I do, I won't promise the world (or even especially regular updates), but I will be making an effort to add more videos and blog posts to the site in the near future. A couple of my arrangements have had a few views on YouTube over the years, so I'll be uploading some more simple/intermediate chord-melodies before Christmas, and maybe even post something on the Twitter and Facebook pages while I'm at it. You never know - stranger things have happened! First, a small confession. While I’ve been aware of Ben’s Ukulele Road Trips – a unique project by the eponymous Ben involving lots of independent travel and ukulele-based songwriting – for a while, it’s remained on my list of Things To Check Out Properly At Some Point (along with Breaking Bad and sushi), so I really hadn’t read or listened to any of Ben’s output. Until, that is, A Ukulele Christmas landed on my digital doorstep. A couple of listens later it’s made me keen to get on to the rest of the BURT oeuvre ASAP. The artwork is the first thing you’ll notice: a fun, slightly bizarre, Christmas card-style tableau of exotic animals in boxer shorts having an extremely festive time. Why a monkey and a giraffe? Well, seemingly just because. I’m already a fan of this. The songs themselves are all Christmas classics you’ll be familiar with: the opening track is We Wish You A Merry Christmas, so clearly Ben isn’t worried about choosing original material that’s niche in any way. However, it’s the arrangements that stand out and show off some true musicianship. That first song is uncynically cheery in its delivery and offers something new in every verse, whether it’s a new set of backing vocals, a quick change to the minor key and back again or a half-time tremolo-backed solo. Further highlights include: a key-change-heavy, bilingual Jingle Bells; a version of Have Yourself A Merry Little Christmas, in which the distinctly homemade sound only adds to the charm exemplified by a lazy mouth trumpet solo; an O Tannenbaum straight out of classic cinema, and a smoky-jazz-club rendition of Chestnuts Roasting On An Open Fire. Whichever gear it’s in, this collection seems to get the right feel for each song. The overall sound is really pleasing, with Ben’s pure vocal occasionally reminiscent of Beirut’s Zach Condon and frequent lapses into French suiting the generally old-fashioned ukulele sound very well. The small reservations I had – a slightly harsh handbell tone reappearing a little too much, and occasionally one too many verses – could easily be dismissed by one less grumpy than I, as they show extra creativity and provide more to listen to. There’s enough interest there to sit and listen to the album with no distractions, but the familiarity of the songs makes this a good one to play in the background at any time over the holidays: whilst unwrapping the presents first thing on the 25th, during the second or third board game or when half the family’s asleep on the sofa during the ‘drunken stupor’ portion of the day. If you like ukuleles and you like Christmas, go for it. Click here to buy the album. You can get it as a digital download, by post with lyrics and chords, or even ​request a Christmas song to be delivered live over the phone by the man himself! In my opinion, Ben’s Ukulele Road Trips is one of the most creative independent voices in the ukulele world at the moment, so do have a look at the blogs, original songs and podcasts and see what you think. This poker-faced Irishman can do it all in ukulele terms. Roy Smeck’s flair techniques, John King classical arrangements, clawhammer and gripping original compositions are all in evidence on his YouTube channel, which is worth time out of any day to browse. I chose this video purely because it’s recorded outdoors on a sunny day, and it’s great fun! These two are proper youngsters – aged 18 and 15 respectively – and they also happen to be an excellent pair of ukulele players. Not good for their age: just good. You can tell they’re proper teenagers because they’re very active on Instagram , posting photos and videos of their day-to-day lives in Hawaii (seemingly mostly consisting of surfing, sandy beaches and swimming with dolphins – similar in many ways to my own adolescence in West Kent) as well as impressive musical performances. Here’s an energetic version of Herb Ohta’s Bodysurfing (recorded three years ago, by the way!). If you’ve ever doubted the power of low-G tuning, have a listen to Kalei Gamiao. Anything he plays, original or cover, is a great demonstration of the importance of feel, and the appreciation of tone, in instrumental music. Here’s another brilliant (and sunny) outdoor video – of Paukauila, from Gamiao’s 2008 album Contemporary Ukulele. If you search through YouTube, you can chart the growth of Aidan James from age 8 through to 14-year-old with a loop pedal and a hairstyle. His recently released debut album, Echoes, may have a lot of production elements, but there’s still ukulele in there in songs like the sweet I’ll Be There, and he’s still playing solo uke covers, like this professionally done Ed Sheeran track. He’s only 19, but he’s been touring Asia and the rest of the world for years already. Largely a guitarist more recently, but still definitely a multi-instrumentalist, Jung specialises in fingerstyle covers of current and classic pop songs, which have earned him an impressive 4 million YouTube subscribers. This version of Somebody That I Used To Know by Gotye is impressively solid and layered, but it’s really a case of scrolling through his YouTube channel and taking your pick. Another Hawaiian aged 27, this time from the Big Island. Influenced by artists including Santana and Rodrigo y Gabriela, Paiva brings an unabashedly guitar-y feel to her playing. She does a few nice, busky covers of chart songs using a loop pedal, but I’ve decided to feature the video of Brittni showing off her licks on stage with her musical hero, Santana himself. Dreadlocked Danish folk musician Tobias Elof brings a different perspective to the instrument with sensitive but fun compositions like Miriam, played here in gorgeous surroundings in Oahu. Check out the harp harmonics! Often to be seen playing in the UK, keep an eye on his website for concert dates. Hawaiian hat-wearer Andrew Molina just seems to be a complete natural with a ukulele in his hands. Often seen performing with his dad Jay as accompanist, Andrew’s uber-relaxed style fits perfectly with the instrument’s sound. Here’s a rarity – a cover of Stairway to Heaven you’ll actually want to listen to. So there you go: plenty of options for your listening pleasure. Let me know in the comments section below if you think I've missed anyone, and remember - if you like something you hear, buy it! These people need our support to carry on doing what they're doing, and nobody makes decent money from YouTube without playing Minecraft or doing makeup tutorials. If you're interested in having ukulele lessons, click 'Contact Jon' at the top of the page and get in touch. It's Saturday morning on Albert Road, Portsmouth. On the surface it seems like any normal day among the eclectic mix of antique sellers and fried chicken joints (and for most people it is), but a closer look reveals something very slightly odd. Moving around in pairs, or alone, chatting or just taking in the nearly-seaside air, people are carrying ukuleles. It’s not exactly Glastonbury in late June, but the signs are there: the first ever Grand Southern Ukulele Festival is in town. I’d taken advantage of some people’s apparent overindulgence on the previous night and driven down for headline act Aldrine Guerrero’s ‘Perfect Practice Makes Perfect’ workshop (loved it, full of useful tips) and had almost 12 hours’ worth of ukulele performances to look forward to. The late morning and early afternoon found me in The Loft, a traditional small venue above the Kings Pub, enjoying the day’s preliminary schedule. Highlights included Liam Capper-Starr’s understated skill, 'Special Guest' Ricky Tart’s vocal power and loop pedal trickery, Chonkinfeckle’s speak-sung Lancashire comedy and a first of two sets from the high-tempo Dead Mans Uke. Just time for a quick bite to eat and then across the road to the Kings Theatre, where the festival would make itself at home for the rest of the day. At 2pm, with a decent crowd settled in to both levels of the venerable auditorium, we met our host – Mister Joe Black, dressed to impress in the first of many monochrome outfits. Joe (pick your own pronoun) did a great job throughout the day, not only of frightening the more genteel sections of the audience, but of dealing with a ‘problem’ perhaps unusual to festival compères: the acts consistently being ready too soon. At an event where the onstage tech setup between performances basically consists of one person unplugging their instrument and the next plugging in and adjusting the height of the microphone, Black still managed to build a rapport while simultaneously dialling down his burlesque sensibilities (..almost – a suggestive Britney-related microphone incident did slip through the net. It’s fine. Maybe nobody noticed) to cater for the scattered preteens among us. He read the room well – audience and diverse performers alike – and gave the afternoon and evening sessions a cheeky, self-aware continuity that fits the ukulele perfectly. First up were the Mother Ukers, just arrived in the DeLorean “from 1922, also known as Bournemouth”. Seasoned experts at taking chart songs of all genres and ukeifying them (that is to say, swinging the rhythm and adding chunky-chunky chords), their version of The Prodigy’s Firestarter never fails to raise a smile. Well done to them, too, for continuing my personal process of being slowly won over to the ukulele bass with a strong and tidy sound, simple but effective. Peter Moss came next, bringing a steady hand, lots of solo experience and an air of quiet competence. He lets his uke do most of the talking, and was the only act to attempt a Roy Smeck number (Rockin’ The Uke) on the day. His Can-Can is classic ukulele entertainment, as are the quirks of his performance – staring down the audience, vaudeville-style, as he plays, and shouting “Hey!” with a big grin at the end of each piece. The performance of classic rocker Ben Rouse, one of the festival’s organisers, was perhaps modestly low on the bill given his prowess and the stylistic variety he brings to the table. With many performers bringing in bass guitarists to counter the ukulele’s natural treble sound, a welcome variation was provided by Jamie Wilson, who accompanied Rouse’s entire set on cello. They’re not the first to think of it (see James Hill and Anne Janelle, among others), but low bowed strings complement the ukulele perfectly (the cello, played well, may be my favourite instrument to listen to anyway), and a song like AC/DC’s Thunderstruck isn’t really complete without the meaty, chugging rhythm part, impressive as it is played solo. This whole performance sounded great and lifted the energy in the theatre. This was followed by sets from Michael Adcock, Vix & her MsChiefs and Seb Olway, all playing very different styles and winning over the audience in their own ways. But the afternoon session still had plenty left in the tank, with Italian Francesco Albertazzi – the day’s first non-Brit, treating us to some of his beguiling compositions and arrangements. With Andrea Negruzzo’s Einaudian piano accompaniment and Albertazzi’s Miloš-esque chops, this is the kind of softly-spoken music they play when you’re on hold to the car insurance company.. except half an hour of this might actually calm you down. Two players who have their technical similarities but whose performance styles are very different are open-mic guru Krabbers and Bermudian Mike Hind (he’s from Bermuda, you know). Both kept it simple, playing low-key, strum-and-sing sets that included plenty of self-penned material, emotional at times but with plenty of laughs and audience participation too. Krabbers understands the power of a heartfelt rhyme, sung by a normal bloke over a Bbmaj7 chord (surely the saddest chord of them all), while managing to fit in a crude poo pun here and there for good measure. Hind (you know, from Bermuda), who played in the evening session, is evidently a seasoned stage entertainer, who bounces off the audience, his fellow performers in the wings, the compère – anyone he can find. It’s all about simply being together, laughing, crying and making music, and that always makes for a hugely rewarding experience for everyone. Dead Mans Uke followed up their above-the-pub set earlier on by closing the afternoon session, ably accompanied by Scouse two-piece the Mersey Belles, whose backing vocals and smiley energy are a great fit for the father-son duo’s more deadpan humour and frenetic musical style. After a break to choose from Southsea’s diverse restaurant selection (tapas, very nice, thanks for asking), we were back on track with Northampton boys Jono & The Uke Dealers, as close to true punk as you can get with two ukuleles instead of battered Strats. There’s that wonderful variety again – they even had a full drum kit! Their shoutalong song Life Is Chaos, mercifully, fell just short of inspiring a brutal mosh pit in the stalls. Another visitor from the continent was next: unobtrusive and beguiling Belgian Ukulelezaza. Masterfully plucking away, lounging on a chair, he brings to mind a park-bench strummer playing only to amuse himself but looking down, surprised, to find a hat full of Euros at the end of the day. Listening to him play classic blues on a uke he made himself carries the same sense of relaxation of watching a master at work in any field, and his right-hand feel on a vintage Martin is a joy. Then, a chance to watch British stalwart Phil Doleman at work. There’s a sense that he doesn’t need to hide at all, his ukulele doing all the work of a full band and accompanying his own rasping vocals. A fun and professional set, but left one question unanswered: what does Diddy Wah Diddy mean? Victoria Vox treated us to a showcase of her considerable songwriting ability – if the next Bond film is set in Hawaii, she’s got a nailed-on theme song in Supermoon – along with charming vocals, inventive yet unfussy ukulele playing and her not-so-hidden talent, the mouth trumpet. An ‘instrument’ with popular roots in the early 20th Century that many people regard as exclusively a comedy device, and that’s harder to play than it seems? How could we not love it? Vox’s ‘chanson’ influences (she lived in France for a year, she informs us) show through the sense of mournful longing in Mon Coeur Vide – a beautifully stripped-back combination of baritone ukulele and breathy vocal. The task of finishing the show fell into the capable hands of Aldrine Guerrero – he of those fab YouTube playalong videos – and he met the challenge with aplomb, harnessing all the day’s energy and guiding it to an awe-inspiring crescendo with the support of guitarist Aaron Nakamura. Playing in a similar virtuoso style to Jake Shimabukuro, but with perhaps a little less physical showmanship, Aldrine lets his incredible solo skills do all the work when taking on Santana’s Europa. A talent for songwriting is also clearly in evidence, though, in the sweet-as-pie With Love, From Italy. Listening to the accompanying story of his recent engagement, followed by the song’s jaunty beachside riffs, you start to wonder quite why Jason Mraz is so much better-known than Guerrero. Surely this, rather than I Won’t Give Up, or even I’m Yours, would make a better first dance at weddings? Get on it, people. This was one of those live performances that could either make you want to pack it all in completely or go home and practise until your fingers have biceps. I went home and practised. An amazing performance. Unfortunately I couldn't stay around for the Late Night Ukulele Cabaret, but for those who could, the night was only just beginning. This entire event had a nice relaxed and accepting feel, and, spread out over a diverting shopping street near the seafront, a pleasant and prominent setting. The Kings Theatre itself played a starring role, an august and characterful yet unimposing venue that allowed the ukulele the breathing space it deserves without swamping it in empty space. There’s certainly the space, geographically speaking, for an annual event like this on the South coast, and hopefully the organisers, who did a sterling job, will be encouraged to do it all again for years to come. I do enjoy a good quiz, and I've been a fan of free trivia website Sporcle for a while now, but how to combine this with a passion for the ukulele? A quick search for the instrument in amongst Sporcle's thousands of user-made games currently brings up a grand total of three quizzes. And two of them aren't exactly hugely challenging: 'What Does My Dog Have?' and 'Name the Strings on a Ukulele'. Head scratchers indeed. So I've made my own! It's a lovely picture quiz with stills from films that (increasingly in the last 10 years) have hijacked the uke's natural charms to lend their characters some easy likability. There are a few old classics in the mix too - all you do is click 'Play' and start typing your answers. Here's the link to my quiz 'Ukuleles on Film'. Note - this will work better on desktop than mobile. Let me know what you scored, and what you think. The Half Moon pub in Putney is a proper music venue, boasting The Who, Kate Bush, U2 (yes, they did used to play in pubs, seemingly) and The Rolling Stones amongst past headliners. The single ukulele in pride of place on the wall next to the usual gifted guitars came, apparently, from Harry Hill and the Caterers. Not the most prestigious of acts, perhaps, and certainly not doing much for the ukulele’s ever-growing image as a ‘serious’ instrument, but the sign above the door to the performance space certainly had the punters talking: Uke Fest West. A full-day mini ukulele festival with workshops, stalls and an evening performance all crammed into that same room once graced by Mick Jagger and The Edge (and Harry Hill playing Smoke On The Water on the hornophone). The room itself was laid out with candlelit tables and chairs, but only enough for a lucky few early birds. With the rest of the crowd either standing or sitting around the edge of the room, this gave the beginning of the evening a slightly odd atmosphere. Someone even had a pair of Sunday roasts delivered to their table early on, the poor waiter having to politely elbow past audience members while carrying a plateful of meat and vegetables in each hand. Before too long, though, and with a good number of people through the door, it was time for the gig to begin. Ben Rouse brought the curtain up with a solo set built on a foundation of ferocious speed and pounding rhythms. He did well, at times, to play over a slightly restless audience (including the aforementioned roast dinner brigade), soon holding the room’s full attention with his showboating style. There’s more than a whiff of heavy-metal-flamenco duo Rodrigo y Gabriela in his driving percussiveness and dramatic posturing. However, he also provides occasional breathing space with sensitive fingerpicking perhaps surprisingly good from a former rock guitarist. Crowd-pleasers Thunderstruck and Rolling in the Deep were present and correct, bringing some energy into the room – the reason Ben was the clear choice to open the show – but there’s certainly variety in there, including a gentle, almost Celtic feel in original composition The Fox and the Pussycat, an unexpected highlight of a really strong set. Next up were hosts U Kew Lele, a group from the Richmond area. They represent a fairly wide age range, and explored a good mix of styles and eras over the course of a set that held the audience’s full attention for longer than can be expected from many amateur ukulele bands. Uke group standards like The Lumineers’ Ho Hey kept toes of all ages tapping and were sung with confidence and competence. There were fleeting chances for members to show off their individual skill, but a little more solo work wouldn’t go amiss – where’s that famous intro to Johnny B Goode? U Kew Lele’s overall sound is great, though, supported by a U-Bass with a lovely tone (well done to both the bassist and the sound engineer), occasional saxophone solos and a wonderful harmonica player who apparently used to play with Johnny Cash. I’m all for adding to the sometimes limited sound of ukulele groups with collaboration from instruments with varying timbres, and the harmonica achieves exactly that without overriding the joyous treble of the ukulele. This group embraces that ethos with open arms. Plus anyone that plays Raglan Road will always get my vote! A lot was made of the group being joined on stage by the Songbirds choir – a product of the same Ritz Music school as U Kew Lele – but their effect was lost somewhat by unsympathetic staging. It would have been nice to be able to see them! As this was a ‘world first’ collaboration, though, these details can surely be ironed out in future. Well done to U Kew Lele, overall, on an engaging and endearing performance. And so on we pushed, through some aching backs and feet in the audience (perhaps just me – I’m sure I used to be able to stand up for hours on end with no problem..), to the headline act. Sarah Maisel and Craig Chee are an inconceivably talented engaged couple from San Diego who have combined their differing genres and voices to make something wonderful. Sarah approaches the ukulele with a focus on early 20th Century jazz and blues standards, while Craig seems to come from a more modern, Jake Shimabukuro-inspired place, and their warm, heartfelt original songs bring together elements from these styles and more. Assisted more than ably by the impressive James Agg (from Cheltenham) on double bass, Chee and Maisel glided through the early exchanges with the easy confidence of true professionals. Their voices, with two very distinct tones, blend with heavenly ease and their on-stage sincerity gives both of them an enviable immediate likeability. This – combined with some astounding ukulele playing, of course – meant their whole set flew by in what seemed like a few minutes. In reality, the audience was treated to nearly an hour of true musicianship from ukes and bass alike. In all, it’s fair to say the first Uke Fest West was very successful, as evidenced by the fact I saw more than one person buying an instrument from the Noah Ukuleles stall straight after one of the acts. If it's inspiring people, what more can you ask for? Surely the next step in the ukulele’s friendly conquest of Britain is to have more events like this in the capital. London needs to up its game in terms of big uke shows and Uke Fest West is exactly the sort of thing we need. Here’s to many more! 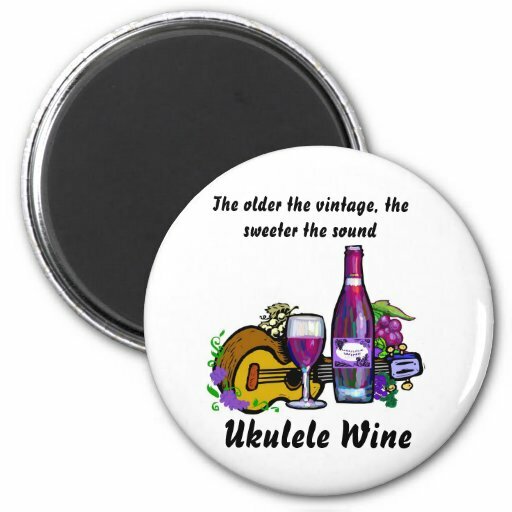 While experiencing that birthday feeling again recently, and being one of those people that's maddeningly difficult to buy for, my thoughts turned to my fellow uke players around the world. There's a rising tide of ukulele-themed presents that are out there, vying for the penny, dime, rand or Euro of your partner, parents and desperate brother-in-law alike, and it's a hugely mixed bag. You might be given the useful little time-saving gadget you didn't know you needed, a strange little design that perfectly sums up your obsession, or you could be saddled with a ukestache tank top. It really can go either way. Let's dive in at the deep end and take a look at some of the best and worst ukulele gifts that could be landing in your lap on one of those two special days this year. This covers anything that could conceivably become part of your everyday playing, whether practising at home or performing to others. Straps, capos and electronic tuners are perhaps the most common (and all totally acceptable, by the way - making the uke easier to play is the whole point!). The ukulele strap world is still catching up to the guitar, but you can get your hands on something more interesting than the standard black or khaki - see right (available at the Southern Ukulele Store). There are also plenty of options for ukulele stands and wall hangers (for ease of access in ukemergencies), as well as increasing numbers of manufacturers making their own leather or felt picks. I usually go to British-based Ukulele Plectrums to get feltrum sets for my younger pupils, who love the variety of colours you can get. Please, please can we stop selling plastic picks to use with ukuleles though? I know you're reading this, Amazon! Anything you can play without using your hands can be played at the same time as a ukulele. If you've got shoelaces, you can use the nifty little low-tech gadget you see to your left - the Toe Tapper. If you've got shoelaces and anything resembling musical timing, you're 100% of the way to learning its use. Here's a nice idea for the most vocally challenged member of your group: occupy those lungs elsewhere with a harmonica and holder! (Although I'd be more concerned with whatever bizarre chord that suave chap appears to be playing...) And, although we all know it's far too silly to be spoken of in the same breath as an instrument as serious and austere as the ukulele, the humble kazoo can also be an efficient and cost-effective way to ramp up those crucial silliness levels in your performance. We all remember this guy, surely? Just me? Well there he is anyway. That could be you, you know, with a bit of investment and a bit (a lot) too much time on your hands. Ukulele Artwork: The Good, the Weird and the Ugly. And the Weird again. Despite my natural aversion to wall art consisting of grammar-free text, I can't help liking this poster (see right), available from Zazzle and containing nods to some of the most important people, places and manufacturers in uke history. There's also a handy reminder of the spelling of 'Kamakawiwo'ole', and the word 'mahogany'... In case you really like the word 'mahogany'. There are plenty of cheap and occasionally cheerful options in the world of badges, to be worn on clothing, strap or anything else you can put a pin through. Here's a tiny political message that could appeal to both the pacifist and heavy metal crowds in different ways (although the two aren't mutually exclusive, of course). Then there's the aforementioned 'Ukestache', and the occasional oddity that makes me wonder if I've missed the joke and then promptly make a mental list of my nine most understanding friends. Another one I'm enjoying - a simple but effective chord chart t-shirt. Perhaps better bought for your non-uke-playing friend or partner, the equivalent to that bowling ball Homer Simpson bought for Marge. You can even buy uke chord temporary tattoos now, if you're really really cool. Without even mentioning the 'Keep Calm...' nonsense that still pervades all corners of the gift market (including this niche), there's something about most ukulele slogans that just doesn't hit the right note with me. It could be the fact that you can seemingly just slap them on anything now without nuance, thanks to the (otherwise very helpful) internet. Exhibit A: the Comic Sans disaster to your left (£44 + P&P). Don't get me wrong - if kept simple, slogans can be an accurate and concise way of summarising your passion for the world (take "Peace, Love, Ukulele" for example). It's just that they can so easily stray into overly-cutesy territory ("Happiness Is Playing My Ukulele"; "Uke Are My Sunshine" (?!)) or try to shoehorn generic humour - "Trust Me, I Can Play The Ukulele"; "Got Uke?". For the most passive-aggressive among us, there's this friendly badge to ward off anything unwanted like sharing or friendships. Or this one, to wear to your wedding or work Christmas party. I mean, some of these are just gibberish, right? Then there's this kamikaze car sign. Disclaimer: use at your own risk. OK, I'll stop the slogan-bashing there, partly because the name of this very website can almost definitely be defined as a slogan, but there's a lot of cut-and-paste rubbish out there, seemingly written by some marketing company, that tries to apply to everyone and only makes us all yawn. Why not come up with a slogan yourself that defines your own unique relationship with the ukulele and all the joy and satisfaction it brings? Then you don't even have to put it on a t-shirt - use your mouth (or keyboard) to say it in a real, two-way human conversation! Or just enjoy playing your instrument and don't overthink it: up to you. Disagree/agree with me? What's the best/worst ukulele-themed present you've been given? Please do comment below. Heard and enjoyed the Ukulele Orchestra of Great Britain? Got yourself a ukulele? Great! (And if not, why not?) While the UOGB have their many merits, though – including having helped to spark a real revival in the ukulele’s fortunes worldwide – there’s now much more to British uke life than strumming along to Ode to Joy in your local concert hall. So, for the first ever Ukes Up blog post, here’s a rundown (in no particular order) of - in my opinion - some of the UK’s best and most interesting solo ukulele players. They're a diverse bunch, covering a wide range of playing styles and ages, so there’s sure to be something to pique the interest of any willing ukeist. Enjoy! As the cover star for the recently published issue 1 of Uke, the UK’s only (I think) print ukulele magazine, it would surely be churlish not to include Phil Doleman in any list of Britain’s best four-stringers. Providing strong, animated vocals and rhythmic fingerstyle solos, Doleman retains a strong 20s and 30s jazz and blues style, so if that’s your bag he’s your guy! Phil was also exactly one half of The Re-Entrants, a delightfully mental (and satisfyingly tight) rock ukulele duo. Their Sweet Child O’Mine cover is well worth five and a half minutes of your life and, like all the best uke covers, serves as a reminder of just how good the original song is. The kind of 17-year-old﻿ who﻿ makes even those of us still in our mid-twenties shift in our seats and feel faintly bitter about our life choices (in the best way possible, of course..). Zoë’s disarmingly authoritative nu-folk sound blends wonderfully with the soothing simplicity of her performance on the baritone ukulele. There’s a homemade-granary-loaf cosiness to her sound, particularly evident in album track Into The Night and, of course, Winter Song, that may well have something to do with her upbringing in shivering rural Scotland. Write her name down, she’s going places – and hopefully taking her ukulele with her! Something of a master of all things fretted, Ben Rouse apparently started out as a rock guitarist and became a committed uke convert a few years ago, like many people, after watching Jake Shimabukuro’s incredible videos online. His diverse proficiency is demonstrated on an active YouTube channel, including classical arrangements and rock and indie covers, but perhaps the most entertaining video is this demonstration of a tiny (British-made) ‘nano’ uke. Born in Lancashire? Check. Permanent goofy grin? Yep. Banjolele master? Very much so. Hey, this guy should do some Formby! Well what do you know, he’s already thought of that. But although his repertoire encompasses much of the Formby oeuvre, there’s much more up Eastwood’s sleeve, as this video of his William Tell Overture arrangement illustrates. The picture quality may be lifted straight out of the 1970s Soviet Union, but it certainly shows some of the sheer musical energy of this quick-strumming force of nature. With only a handful of YouTube videos to his name so far (and with a criminally low view count! ), Michael Shepherd falls firmly in the ‘one to watch’ category. His passion for the instrument is clear to see in his performances of self-composed solo instrumentals. This heavy-metal-influenced piece manages to incorporate the delicate capabilities of the ukulele with pounding right-hand rhythms and flashier strumming techniques. An upcoming appearance at the 2015 Grand Northern Ukulele Festival is hopefully a sign that there’s more to come from this guy. I recently stumbled across this video of Zahra’s performance at N’Ukefest 2014 and.. well, give it a watch. If you’ve ever thought the ukulele might just be a bit too limited in style and range, a listen to some of this Scot's innovative interpretation of the instrument will set you straight! Incorporating fingertapping, effects and looping, her genre-busting style is pretty mesmerising and belies her seemingly very understated on-stage personality. In her own words: “ I am not seeking to adhere to a traditional view of musicality , nor do i wish to allow myself to be influenced by a competitive ego ..... what i convey here is merely expressions of self.” Fair enough then. He may only be a young’un, but he’s clearly done his ukulele homework, as this great Roy Smeck rendition will testify! He’s got a frantic strum on him and at only 16 years old there’s no telling how far he can go. Combining an understated performing style with a variety of impressive playing skills in both hands - and representing a strong East Anglian uke scene - Liam seems equally at home writing his own material as creating compelling ukulele arrangements of existing songs. My pick from his YouTube channel (Starrman4allseasons) is this evocative uke-composed number about the occasional melancholy of air travel, with some lovely fingerstyle textures towards the end for good measure. Understated strumming, chord progressions that are simultaneously poppy and wonderfully ‘ukey’, combined with utterly charming vocals. There’s not too much else to say about this deservedly popular singer-songwriter from Brighton. Latest album Silent Cynic is much more guitar-led and has a bigger sound in general, while The Rhythm You Started and Love.Life.Ukulele (unsurprisingly) have more to entice the uke enthusiast. We do love it when artists bring out their own ukulele tab books.. And The Rhythm You Started is so damn catchy! ​Have I missed anyone? Think you deserve a mention? Want to let me know what a fool I’ve been? Feel free to do so in the comments section below: I’d love to hear what you think.